It has been an interesting experience to visit two destinations on the east coast and compare the advance of spring from one to another. Washington DC was sunny, warm and flushed with green on Easter Sunday. 48 hours later however, Boston, Mass., was gloomy, chilly and the trees were still bare. Early leafers like the willows were showing but I would estimate that they were at least 3 weeks behind Washington DC and northern Virginia. 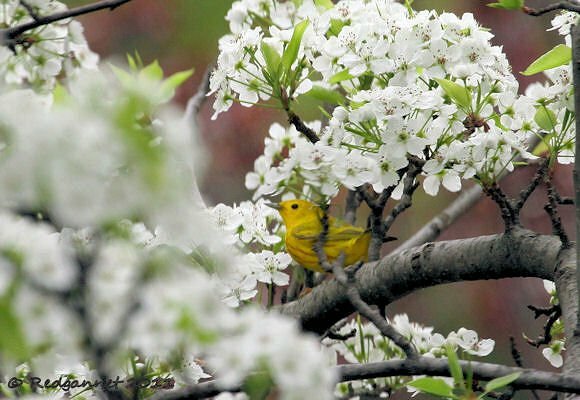 In Boston, this pear tree was in full bloom and playing host to at least two singing male Blue-winged Warblers Vermivora cyanoptera. Pear trees usually peak before cherry blossom and the Washington spectacular had taken place in early April. Such things however were afterthoughts when confronted with such an entrancing warbler in a setting like Mount Auburn Cemetery. These two birds appeared to be eating the blossom petals, but their diet more usually consists of insects and I suspect that actually, the petals were collateral garnish, pretty much the opposite of accidentally eating the bug in your side salad! They had stayed for a few days by time of writing, but are unlikely to nest in the well tended cemetery. Their preferred nesting habitat is forest edge, scrub and disused farmland. As a ground, or near to ground, nesting bird, they like a good deal of low cover and the female usually spends much of her time skulking in the undergrowth. 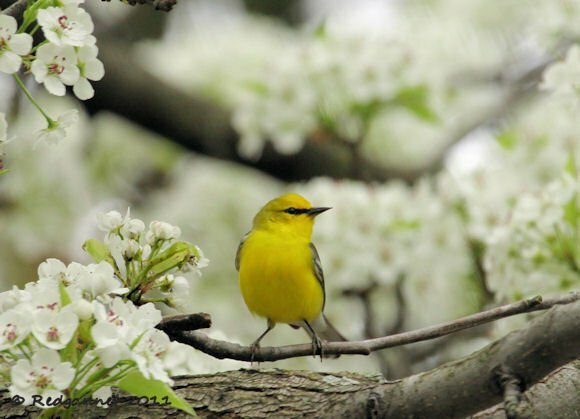 My wife does not often show much interest in my extra-marital activities (although she does encourage me to go abroad a lot and then lock myself away in the study for long periods when I get home), but even she was taken with the Blue-winged Warbler. However, she questioned whether “skulking” is a very lady-like behaviour trait. So in deference, the female is modest and demurely unobtrusive until such time that her workload, raising young, compels her to venture into the open and become more evident. Blue-winged Warblers are fairly common, yet not seen all that often. I got my first fleeting glimpse of one just two days before this encounter. They are very closely related to and sometimes hybridise with its sole congener, the Golden-winged Warbler, producing fertile offspring. The dominant hybrid, from both pure parents, was once thought to be a separate species, Brewster’s Warbler. 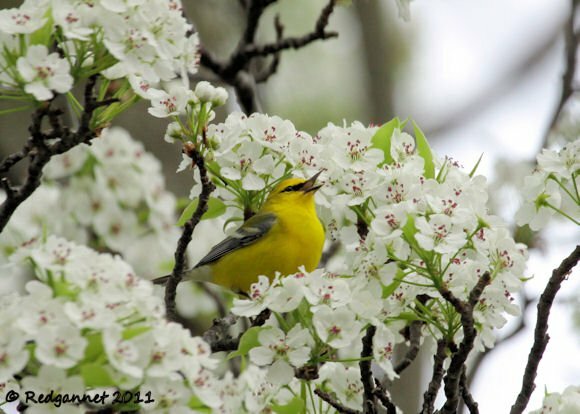 The recessive form known as Lawrence’s Warbler comes as a result of one or more hybrid parents. Both species did well during the colonization of America and found good nesting grounds in recently cut forests and farmland. More recently changing agricultural practices, reforestation and the expansion of towns and cities have reduced their potential nesting sites. 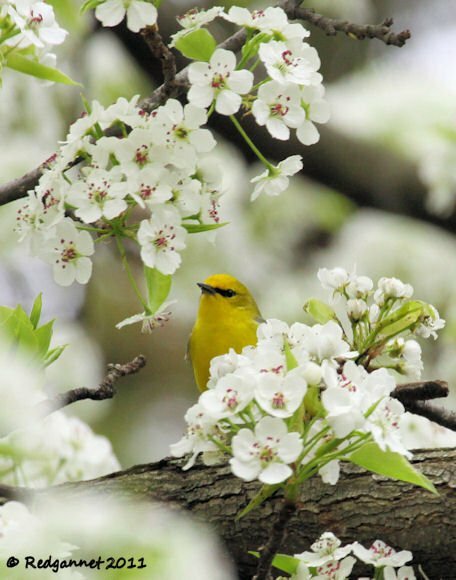 The Blue-winged Warbler is still faring quite well, but is has been suggested that it is adding to the more vulnerable Golden-winged Warbler’s woes by displacing it at the remaining suitable sites. I was particularly delighted to see the birds. 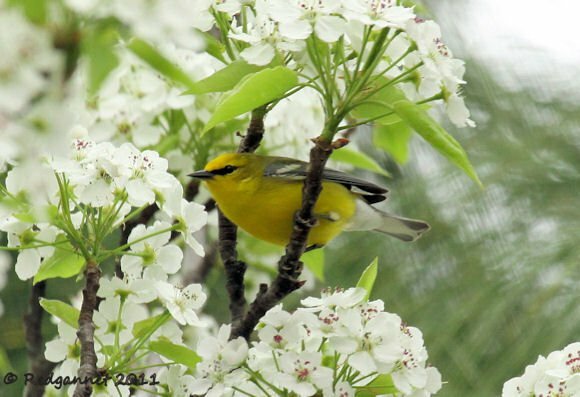 My first sighting of a Blue-winged Warbler had been a fleeting glimpse just 2 days before. Lack of familiarity with the species and such a brief look disallowed my tentative identification from appearing in red on the list, the picture below clinched it for me though. I had seen the strike-through on the eye and the brighter forehead and felt comfortable retrospectively listing it in red. I was struck by how strongly the bright forehead of the male stands out. Even in gloomy light, it serves as a good field identifier. The black strike-though on the eye and 2 white wing bars on the blue-grey wings identifies it as a pure bird. The latin binomial has been recently updated from Vermivora pinus, which had for some time been seen as irrelevant, to V. cyanoptera. 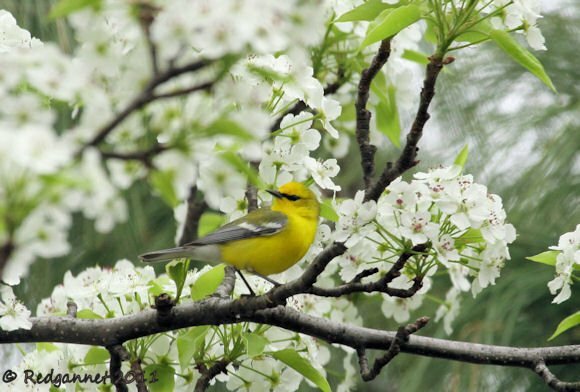 The previously congeneric Virginia’s Warbler, Lucy’s Warbler, Nashville Warbler, Tennessee Warbler, Orange-crowned Warbler and Colima Warbler have been reassigned to the genus Oreothlypis, while retaining their specific titles. Only the Golden-winged Warbler and the sadly presumed extinct Bachmann’s Warbler remain in the Vermivora genus with the blue-wings. 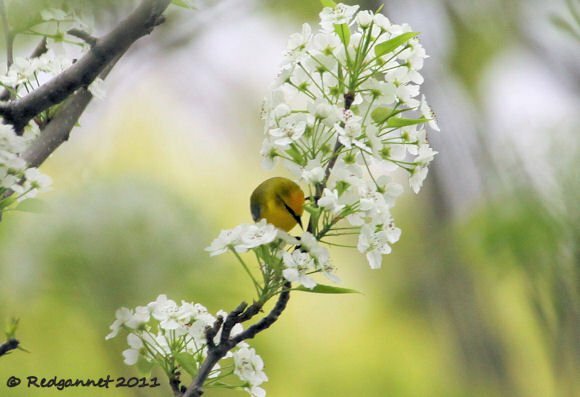 A Yellow Warbler popped into the pear tree to join the blue-wings. It was more timid than the Vermivora and remained in the far side of the tree but, just once, it gave a good view for the photo above. Sadly, my printer has run out of yellow ink and it prints Dendroica petechia with red cross bands as well as its more accustomed red length-ways streaks, so I have to put it up here to see it. Anyway, when Wood-Warbler Week was suggested, I think it was really the Dendroica genus (or Setophaga, I hope you are keeping up) that The Management had in mind.